Though he's played in all five games this season, it had been more than a month since Warrior running back David Farmer caught a pass. His three-catch performance against USC on Sept. 3 was the extent of his season statistics. But against the Aggies, Farmer more than doubled that total, catching seven passes for 52 yards. "They gave me the ball like I wanted," Farmer said. "I don't know, it just worked out that way." The freshman from Santa Cruz, Calif., made his second start of the season against New Mexico State, filling in for the injured Nate Ilaoa. Ilaoa did not suit up for the game because of turf toe. While he had five catches for 49 yards by halftime, Farmer, who was being used mostly as a blocker or bail-out receiver, had no rushing attempts. In fact, the Hawaii offense didn't execute a designed running play until early in the fourth quarter. "It's good for my passing average, but I wasn't really thinking about it. I just wanted to play," Farmer said. On that rushing play, Farmer turned the left corner for an 11-yard gain and a first down. It was his only carry of the game. He was replaced by Mario Cox midway through the fourth. Singletary hospitalized: During the second quarter, Hawaii defensive line coach Vantz Singletary was taken to Kaiser-Moanalua Hospital after complaining of light-headedness and dizziness. The 39-year-old, who was conscious and sitting up under his own power, was given oxygen and looked over by medical staff in the hallway behind the press box. After several minutes, he was taken to the hospital for further examination. "He's OK," UH sports information director Lois Manin said. "He was feeling faint, so they're just taking him to the hospital." "He was overheated," UH athletic director Herman Frazier said. Singletary is in his seventh season with the Warrior program. 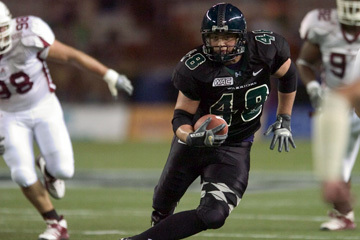 Hawaii's David Farmer had his eyes on the end zone during last night's game against New Mexico State. Martinez feeling special early: Despite waiting six games to see his first action of the season, it didn't take A.J. Martinez long to make his presence felt. The sophomore returned the opening kickoff 67 yards to help set up the Warriors for a score less than 2 minutes into the game. "There's been holes there the whole time," Martinez said. "All I had to do was follow the big men and they got me through." After his second kickoff return went for 44 yards that helped set up another Warriors touchdown, the Aggies didn't give Martinez another opportunity for a return as they kicked away from him the rest of the game. But his two early returns provided a huge boost for the Warriors special teams unit. "Special teams is always a big factor -- you win or lose games based on it," Martinez said. "It's just as important as Colt (Brennan) throwing seven touchdown passes." Mock gets a taste of the end zone: Wide receiver Chad Mock capped a career day by hauling in his first touchdown reception on a 44-yard go-route from Brennan midway through the fourth quarter for Hawaii's final score. Mock finished with a career-high 10 catches for 147 yards and the one touchdown. Back home: Freshman David Niumatalolo was in familiar territory last night. The Aggies' starting right defensive end is a former Kahuku standout and was part of the Red Raiders' 2003 state championship team. "It's a great feeling coming back to play in Aloha Stadium, but it didn't end the way I would have liked," said Niumatalolo, who was greeted by about 10 fans in the stands on the makai sideline after the game. Niumatalolo was matched up directly against another former Kahuku player, Hawaii left tackle Tala Esera. "I have a lot of respect for him," Niumatalolo said. "I watched film on him and I watched him play at Kahuku. He's a great player with great feet. He's the total package, and he had the upper hand in this one. I could have played a whole lot better." Niumatalolo is the nephew of Navy assistant Ken Niumatalolo.